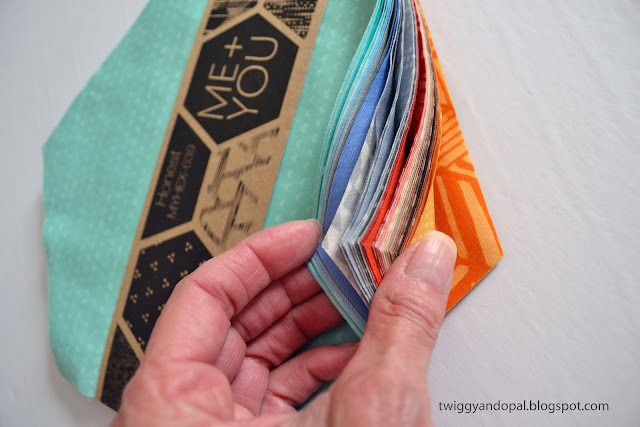 Twiggy and Opal: Home Again :: And A Little Fabric Too! I'm home again!! I rarely travel, so a week a way from all my creature comforts took more of a toll on me than I ever would have thought! I love my pillow...my bed...my shower! That being said, I had a fabulous time in Minnesota with family. I was able to see my sisters, aunt & uncle, nieces & nephews and cousins, but most importantly I was able to see my mom and help her pack up for the big move back to Oregon. I know she was worried about flying and the toll it would take on her. Happily she had my two sisters to help her every step of the way and she made it in one piece! She is doing well and has nearly recovered from all the chaos that is accompanied with a big move like she did. The hardest part of the trip was not having Wi-Fi for my laptop! Another creature comfort we take for granted! After a couple days of being without, I actually enjoyed having that pressure removed. Taking time away from social media and computer access is something I recommend even if you are not on vacation! We all know how easy it is to get sucked in to the electronic black hole. Time consuming is an understatement! Maybe it's time to set some limits for myself. Imagine what I could accomplish if I could cut the electrical umbilical cord once in a while!! When I got home I was greeted with this love bunch of precuts! I was lucky enough to win a random drawing for entering my quilt 'Revitalized' in the Pantone 2017 Quilt Challenge. The challenge was hosted by No Hats In The House and Bryan House Quilts. 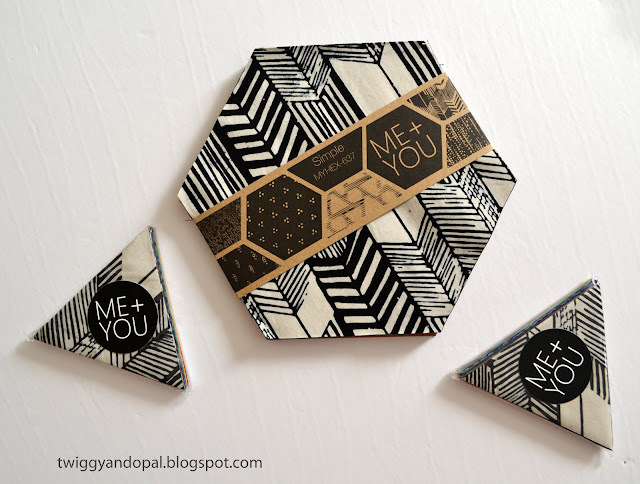 I've admired Me + You Indah Batiks for a long time and I'm thrilled that I get to see, touch and use them! I love the modern take on batiks with the geometric designs. Once I figure out what I'm going to make, I'll take detailed photos of the prints. I'm that way...I like to look and touch the bundles for a while! The Hexagons are 8" and the triangles are 4". 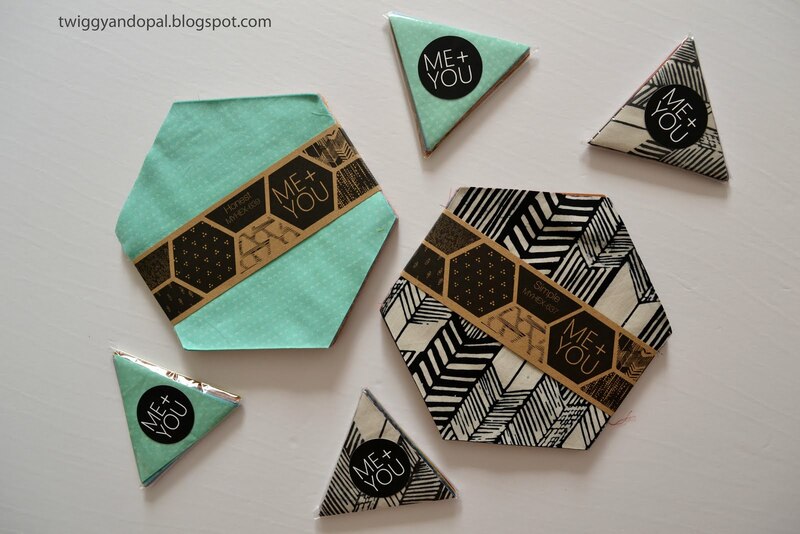 I'm not sure if I'll keep the hexagons intact or cut them into triangles. 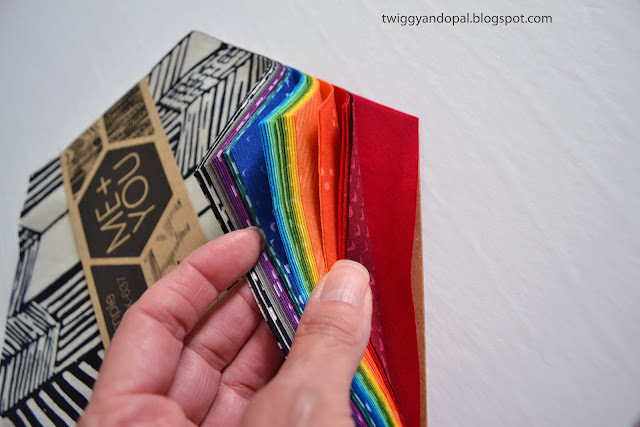 This one is full of rainbow colors and naturally has me salivating with ideas! Before I left for Minnesota, I had to see if there were any quilt shops near. And happily there was! 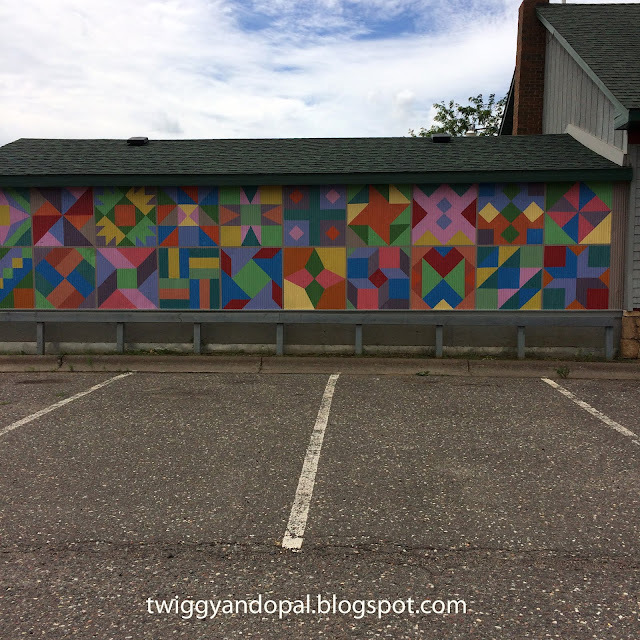 I loved this colorful quilt block mural painted on the side! Like a magnet it drew me in! Quilterati is in Cambridge Minnesota. A cute little shop that had fabric in three rooms. Prints...lots of prints! It wasn't until the third room that my heart skipped a beat, the room with solids! 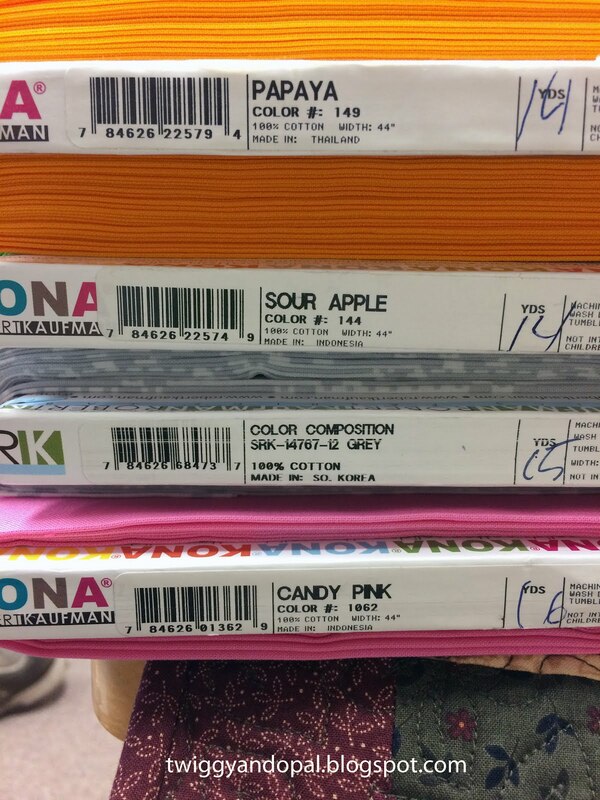 I ended up buying only three colors because frankly, I didn't need more fabric! However I wanted to support the shop and I knew I didn't have these three in my stash. The print was actually on clearance which is the only reason I bought it! It'll come in handy one day! Because I like to write the color on the selvage of each solid, I figured the best way to remember the names of the colors was to take a photo. Very helpful especially if the receipt doesn't include that information. That's that! A little vacation, a little fabric, a little fun! I am so ready to get to work on something!! A week without my machine is torture! I'm slowly easing back in the swing of things by trying to finish my Glam Clam quilt! I keep worrying that if too much time goes by I'll forget how to piece it together! Only a couple more rows to go! So much eye candy! What a good idea to write the solid color on the selvage! Have fun 'easing back in'. Glad your mom is doing ok.
Now if I would just get back to quilting! 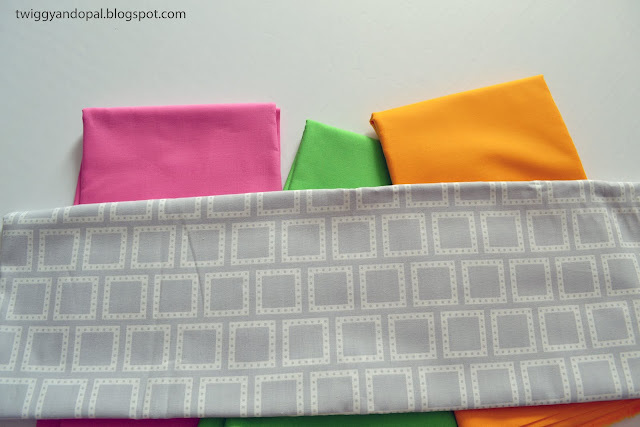 It’s always fun getting fabric…I cannot lie! I just wish an idea would come to me for those precuts! Thank you for mentioning my mom. She is just about settled in and made the trip amazingly well! Welcome back :) A little time away is a good thing. Sometimes we don't realize how much we use our electronics until we can't. I'm glad I'm not the only one that takes pictures so I don't forget things. I do write stuff down but lose the list. 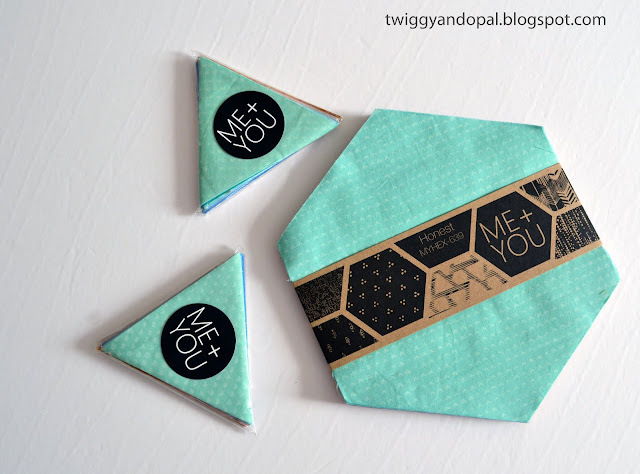 Those batiks are to die for and I can't wait to see what you do with them. I was so mad I took my laptop and couldn’t use it! But after a couple days I didn’t miss it at all. 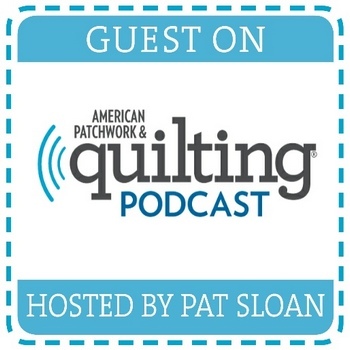 A small break from electronics, internet and quilting was sorely needed and very welcome! I need to figure out what to do with the batiks, I’ve admired them for so long and now that I finally have them…I don’t know what to do with them! The pre-cut curse! I'm so glad that everything went as smoothly as it could for your mom and that you had some down & unplugged time. We all need that occasionally. Brilliant solution to take a photo of the bolts!! It couldn’t have gone any smoother! When you don’t have a sharpie handy, a photo is the next best thing! Glad to hear you had a nice time visiting with family and that your mom got moved safe and sound. Taking time away from the internet is something we should all do once in a while. Your real life shopping trip sounds like it was a welcome side trip and your picks are fantastic! Welcome back ! I'm looking forward to seeing what you'll do with these precuts ! Ah, genius solution for documenting fabric names/colors! Most of my local shops don't include the info on the receipt, so this will help a lot. (Head slap for never thinking of this.) I'm glad you had good family time and a successful move for your mom. Moving is always stressful--and more so (and more emotional, I think) as we age. Yay for you adjusting to the internet downtime. Social media is both wonderful and a big weight. Welcome home Jayne. Travel is fun but coming home is my favorite part! That second hexagon set with the black and white piece on top is just lovely. And I didn't even know you could buy triangle sets! Thanks for sharing. I have just recently run into an issue with identifying a fabric color - luckily I was able to guess right on the second try, but I may have to start taking pictures of the bolt ends too! Great idea! Welcome back, Jayne! I think you will love those Indah Batiks! So gald for your time away from the screen!!! We did have life before computers, didn't we!!! I'm so glad the move went well for your Mom, I hope she settles soon, it can sometimes take a while. Those batiks are beautiful, and the rainbow colours are just fantastic, I love batiks. I haven't seen precuts in hexagon or triangles over here, good idea, and the great thing about batik precuts is they won't fray either.